Just when we thought the Rocky franchise had retired to that squared circle in the sky, along came Creed two years ago and delivered a knockout blow. 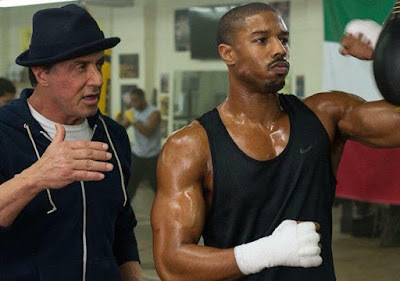 With Ryan Coogler behind the camera, Michael B. Jordan leading the way as the son of Apollo Creed, and Sylvester Stallone's Oscar-nominated performance, a sizable box office followed along with promises of a sequel. What became clear was that Coogler would be too busy to do anything more than help out with the story, and we've seen Stallone be very vocal about what he expects from a followup. Well now we see why he's been talking up the film so much, because Stallone is not only writing the script, but he will produce and direct. What we know is that Stallone plans for this to be a continuation of Rocky IV in some ways, like the return of Dolph Lundgren as Ivan Drago. How exactly does Drago fit in? Maybe Adonis will battle Drago's kid? Because surely we won't see Rocky get back in the squared circle, right? RIGHT!?!? Honestly, this does nothing for me. What made Creed great is that it moved on from the tired storytelling that plagued the Rocky movies in recent years. This seems like a step downward into a lower weight class.